Summer 2017 is turning into the summer of cold treat destinations. From tried and true to very new, below is your guide to the best ways to cool off without taking a dip. Arguably Kelowna’s favourite ice cream destination. With a wall of delectable flavours to choose from and a location steps away from some of downtown Kelowna’s most photographed landmarks (The Sails, Ogopogo himself, and Okanagan Lake) everything about a stop to Moolix is an Instagram post waiting to happen. Okanagan Ice Pops is the best “hole in the wall" find on Bernard Ave. Serving flavour combos like Rosemary Cantalope, Mexican Street Corn, and Strawberry Rhubarb (local ingredients, yes please) creativity is mighty at this small shop. Follow them on Instagram @okanaganicepops, they intro their newest flavours and reveal their hottest sellers. With dairy and vegan options, there’s something for everyone. Okanagan Ice Pops local collaboration with The Vibrant Vine (3240 Pooley Rd. ), wine pops, is the stuff of our wine dreams! Available at The Vibrant Vine&apos;s snack shop, the wine infused treats are prefect for a sweet bite on the winery’s lawn. The Woopsicle is made with, of course, The Vibrant Vine&apos;s signature Woops and has perfect summer hints of vanilla and peach. Drooling yet? QB Gelato did their homework; studying in Italy to hone their gelato skills prior to opening. Tucked into a beautiful naturally lit space in the Landmark building complex, the shop begs for you to sit and stay a while. And while you’re sitting, enjoy decadent, luscious, hand-crafted gelato. Opt for the signature Holy Cacao (a chocolate lover must,) Purple Dream (with lavender essence from Okanagan Lavender & Herb Farm,) or PB & J (your five-year-old self really wants this one) to curb your cool down cravings. Karat knows sweet treats. Known for high caliber chocolate offerings, with must try flavour profiles and local ingredients, chocolatier Julian Helman knows the way to satisfy your sweet tooth. Visit Karat Chocolate on Fridays and Saturdays for homemade ice cream (with ever evolving flavour combos.) Need a caffeine fix? On Fridays, Karat partners with their neighbours Canoe Coffee Roasters for Affogato Fridays. Perfecto. 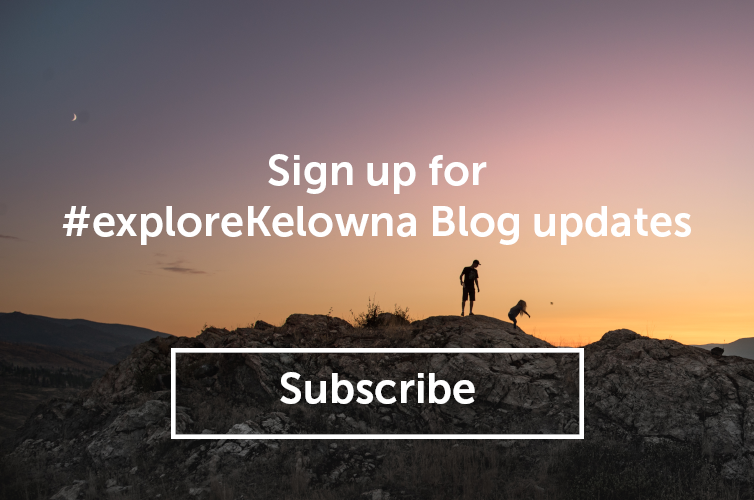 Jen Widmer is a proud Kelowna resident who loves highlighting everything great about our city to media and potential visitors through her Tourism Kelowna role. Away from the office, Jen enjoys game nights, golfing one of Kelowna’s stellar courses, a good book with a glass of local wine, Netflix (who doesn’t) and scoping out great food and wine events in Kelowna. She and her husband have two young girls that love weekend brunch, Okanagan Grocery croissants, and exploring the many wonderful parks and walking paths the city offers.